My mother really liked a photo that I sent her of King and I. It was taken a few years ago when I was doing some groundwork with him. He was in a good mood, and paying careful attention to me. I was actually looping the lead rope around his neck at the time, but it does look as though I am hugging him (and I will admit to the occasional horse hug!). Anyway, Mom had an artist friend of hers, Eleanore Dempster, do a painting from it. I am really quite taken with it. Isn’t it lovely? This was when King still had some charcoal grey on his face, and Eleanore really caught the marbling effect that I always liked so well. I miss his dapples and marbling now that he’s all snowy white. Eleanore has a profile page on the Osoyoos & District Arts Council website. She has some lovely work displayed there, go and have a look! We’ve been working with the yearlings at work lately. Winchester and Freeman. Winchester is Loula’s foal from last year. He was the only foal we had that year, and when weaning time came around, he needed a friend. Freeman was a leftover from the Woodbine sale. He didn’t sell and his owners gave him to my boss for free (thus “free”man). They are best friends of course. So lately, we’ve been bringing them in to eat in the evenings, and handling them a little bit afterwards. Winchester, who is a classically handsome and very amiable chestnut with a narrow tidy blaze has been a perfect gentleman. He looks a little puzzled at our requests. But he’s willing to go along with it all so long as he gets some pats and a scratch on the neck. “Sure… seems crazy, but if you guys want to pick up my feet? Go ahead.” He has quietly accepted a surcingle and a bit in his mouth without any anxiety or resistance at all. He seems to mostly be happy with all the attention. And in fact has gotten more friendly when he’s out in the field since we started. Comes sauntering up to greet me whenever I’m out there. “So, wanna scratch my neck again? You can pick up my feet or something if you want?” He strikes me as a very classy kind of guy. I suspect he’s going to be a good boy his whole life. Winchester is another one of our Raj Waki kids who have turned out to have superb temperaments (Monster, William, Victoria, Chatty, Paris… only Paris is kind of nutty, and she gets that from her mama). Raj himself was rather famous for being an amiable, classy guy. He used to stand at stud and during the rest of the season was used as a pony (for leading fractious horses to the track and back) at Woodbine Racetrack. Sometimes he was used to pony his own daughters to and from the track. He’s still alive, and is in retirement at Gardiner Farms. Freeman has also been a star. And that’s a good deal more surprising given his personality. He’s by a horse called One Way Love, and it seems that his kids are not all that steady minded. His mama was apparently a little reactive and nutty. And he definitely has that tendency too. When he first arrived, we were all sort of horrified at his legs, which were frighteningly crooked. And at his strange reactions to things, which were very extreme and unpredictable. For a long time we couldn’t get hold of his halter. If he lost a halter, everyone’s heart would sink, because it was likely to take an hour or two to find a way to trap him and get another one on him. I spent a lot of time working with him in the spring, trying to get him comfortable with ropes and halters around his head. I used clicker training, which I know the boss disdained initially. But after a week of that, Freeman had an epiphany about halters “Wow, I’m a very smart guy! Check out the cookies that appear when I stick my head in this halter thing!” So I used that to teach him to pick up his feet too. I didn’t touch his back feet, because the little lunatic could kick faster than you could blink. But he got really good with the front feet. So we were very very careful about Freeman. The boss picked up his feet slowly and with lots of praise. Took a couple of extra days before actually doing the surcingle up. Took another couple of days letting him get used to that before moving on to a bit in his mouth. But Freeman has been terrific. All the extra time and care with him seems to be paying off. He is walking calmly in his tack. Totally unconcerned. Just home from delivering the filly to her new home. She loaded up beautifully, and travelled well (as most Standardbreds do). Unloaded quite cautiously when we arrived. She was a little worried and snorted softly as she walked around. But was oh so polite to all the people and the horses. We put her in a small paddock next to the resident horses, and she walked around with me, examining it all carefully. Then went over to greet the herd at the fence. I was quite amazed to see that they all instantly adored her. There were two mares and two geldings talking to her, and not a single squeal. No pinned ears. Nothing other than the boss gelding trying to wrap his neck around her to keep her at the fence. He was utterly entranced by her. To the point of making a complete fool of himself. We watched them for a long time, then I went in and had dinner. Came back, and the boss gelding was STILL utterly entranced by her. And by then she seemed very pleased with her situation. Happily accepting carrots and following her new owner around the paddock to beg for more. So far, so good. Her new owner wants to both ride and drive her, and since it’s a friend, I should get lots of updates on their progress. Just had a lovely filly arrive, looking for a new home. Her name is Spanish Lady. She’s a three year old Standardbred. Never raced. She was in training, but has never even come close to being fast enough to qualify. She is sound, and by all accounts, exceedingly quiet. Trainer says she is quiet enough for a child to drive. And has no spook in her at all. The groom was apparently giving her kids pony rides on her too. And given that she’s been in race training and has been fed like a racehorse, she will only get quieter once she’s been turned out and allowed to relax. So this is likely to turn out to be a very bombproof sort of mare once she’s had a couple of years to finish growing up. She’s here in my round pen at the moment. Just arrived half an hour ago. Super friendly. Chowing down happily on a pile of hay. Thinks maybe Swamp Dog could be her friend too. She has not yet been backed, though I will probably do that within the next day or two. She’s free to a good home. It has to be a pleasure home. No racing. No breeding. I follow up on the horses I place, and require references if I don’t know you. I always accept these horses back if they turn out to be unsuitable, and will retain ownership for period of time to make sure that everything goes well. I can deliver within a few hours of the Greater Toronto area for the price of fuel. A couple of days ago, when I went out to feed in the evening, I looked down at Diego’s legs as he walked in for dinner. His left knee looked a little swollen. There were no obvious cuts at first glance. But I washed it off and looked carefully. Sure enough there was a small cut, perhaps an inch and a half long. It was scabbed over and looked more like a shallow gouge. So I scrubbed it pretty vigorously with iodine scrub. It seemed to clean up okay and still didn’t look like much of a cut. But the swelling in the knee bothered me. So I put furacin ointment on it and bandaged the knee before calling Misha (his owner). Remarkably, she took it reasonably well (she worries… to put it mildly). Though she did later send me a panicky text message which sounded much more like her usual self. I gave him some bute to get the swelling down, and thought about that cut for a while. Something about it really bothered me. So I called the vet and asked about antibiotics. She suggested I wait until morning to see if the swelling went down. In the meantime, Jen went looking around the paddock and discovered a broken board. He was apparently harrassing Twister over the fence again. He’s been quite aggressive ever since Twister came home, and I’ve been a bit worried that he would hurt himself with all the striking and squealing. Sure enough, it looked like he’d broken one of the brand new solid oak boards that we repaired the fence with a couple of weeks ago. The next morning the knee was probably only half as swollen. So I relaxed a little. But it gradually got bigger through the day. I called the vet back and asked if I could come and pick some antibiotics up. It was making me very uneasy to look at the knee. The cut really did not look at all bad, but it bugged me. I kept poking around it, trying to make sure there was no puncture or splinters or anything, but couldn’t find a thing. His leg looked a lot better by this morning. Misha came to clean his stall, and turned him out in the round pen for a while. So he, of course, did some galloping and bucking, and some Lipizzaner type airs above the ground. By the time she brought him in, he’d split the cut open. And in doing so, made it apparent that there had been a little puncture right at the front of the cut. Luckily it’s on an angle forward (he probably stabbed himself with a splinter from the board he broke with his knee as he pulled he knee back out), and seems to have totally missed the joint. It looks clean and pink inside the wound, so it should heal up fine. But it’s likely a good thing he got those antibiotics. Geez. Really… it’s no wonder the crazy little bugger is covered in scars. He is just constantly getting into things. He needs to live in a padded cell. For now, he’s stall bound, which is as close as we can get to imprisonment in a rubber room. Well, the final set of ride results should be in within a couple of days for the OCTRA season. And Dressy did well this year. She finished 2nd in the Silver level 31 mile ride, which ends up putting her 4th for the day I believe (Chrystal’s little mare won not only the Bronze level, but top score of the day too!). With that set of results, Dressy will end up in second place for the season in Set Speed. There’s no official ranking for Set Speed yet of course. But I do know that there is someone who would like to sponsor awards for Set Speed, so it might happen. We shall see. Maybe Dressy will end up with a top ten ribbon after all. She’s a good, honest mare who always does her best without too much fuss. And she really seems to like the sport. The horse who will win top Set Speed horse is Klein. He is a cute little grey Arab with terrific heart rates. Totally deserves to win, as he and Michelle are a great team. It looks to me as though Grace (Chrystal’s mare) will move up to 5th in the set speed season rankings after this last ride. She placed first at all three of the Set Speed rides she did. Diego looks to be 11th in set speed, just barely missing the top ten. He had a good year too, despite missing a couple of rides. The 50 he did at Coates Creek was pretty spectacular, despite Misha’s heat stroke that day. He was, as far as anyone could see, completely unaffected by heat. And placed 6th in only his second 50. The weather forecast for yesterday`s ride looked pretty bad most of the week. And Saturday was a really awful day. But when I got up Sunday morning (well… when Misha called me from her car… already stressing about getting Diego on the trailer) the pre-dawn was reasonably bright from the moonlight, and the wind had died. I would have been happy enough with cold and rain. But there would have been a lot of cranky volunteers for us to deal with. It turned out to be a cool, fresh October day with occasional bouts of sunshine, and absolutely gorgeous trails. Diego was a little sticky about the trailer, and Misha was losing it a bit when I got out. Not falling apart, but starting to vibrate a little. She handed me the stock whip and I stood on Diego`s near side to prevent him from evading to that side. I don`t generally do much. Just stand there and make him nervous. But eventually, as usual with him, he allowed the unsettling person behind and the encouraging person in front to entice him on. He`s a good little horse, but he wasn`t broke until he was 11 or thereabouts, and still thinks he should make his own decisions. Trailers have always been a problem for him. Dressy, of course, loaded up directly. As always. She marches up, turns herself around and backs right in. “Do up that chest bar, gimme my cookie and my hay bag, and let`s go“. It’s about an hour and a half to Coates Creek ride site, and at 6am on a Sunday morning, traffic is near non-existent. So it was an easy trip. We arrived just as vetting started. Misha set up her electric paddock and split it down the middle to give Dressy half. It’s one of those Zareba EZEE corrals, and I have to say that although it looks nice, and the theory is good, in practice the damn thing never seems to work the way it should. Yesterday, it went up okay, but the power didn’t work. Turned out not to matter, as they were not in it for long. But I prefer my homemade electric paddock with the cheap step in posts, a ground rod, a roll of wire, and a Zareba Yellow Jacket portable fencer. Cheap, easy, and it actually works. There were 20 horses entered in the 31 mile Bronze level ride (which is between 4 and 7 miles per hour), and 6 horses in the Silver level ride (between 5 and 8 mph). There were three loops, with a gate at the end of the first and a regular full vet check at the end of the second loop. A gate is where you ride in, get your horse down to a 64 heart rate, and trot for the vets to watch (for lameness) as you ride out. The clock continues to run through that type of hold. I haven’t done a gate before at a set speed ride, and I really underestimated how much it would slow us down. Towards the end of the first loop, my GPS was reading around 8.5mph average. By the time I rode out, it had dropped to around 7mph. It gradually climbed back up through that second loop. But we really never made up that time. The full vet check didn’t have as much of an impact, since the clock stopped when we reached parameter (56bpm) and we started our 40 minute hold. Dressy really moved out on the first loop. It was unfortunate as it turned out, because she bonded to a group of horses that don’t pace well for her purposes. Dressy has a nice big trot, and she can go reasonably fast. But her forte is her steadiness. She goes out and trots fast and steady (12+ mph), and she can maintain that for a long time. But at 14-16mph the trot is much too extended. At 16mph she starts breaking to gallop, and definitely cannot maintain that for a long time. It takes way too much out of her. I struggled with her quite a bit. I tried taking her back, but she’d decided that the big grey thoroughbred was her friend, and she wanted to catch him. She paced, and fought me, and kept catching up. So after the first ten miles when we went through the gate, I held back so they were long gone. But she power trotted until she caught them. If they’d maintained that 14-16mph speed, we never would have. But they were alternating between galloping fast and trotting slow. So overall she would have actually travelled faster… If I could have separated her from them. But there’s no way I could have passed, since I’m pretty sure those horses would have gone with her. I also find in the first few miles that Dressy can be very spooky in the lead. So I generally want her knowing there are horses ahead that she can focus on catching, instead of focusing on the monsters in the bushes. At the 20 mile vet check, I held back and waited for Sue T. She’d lost her riding buddy (pulled) and wanted to ride with someone. That suited me, because she is a very experienced rider and rides a steady pace. Which is what Dressy needed to do as well. That loop was much better for Dressy. She was a little tired after all the shenanigans on the first two loops. But she trotted the whole thing without any issues. Chrystal and Grace passed us on that loop and Dressy went with her for quite a distance. But eventually we let her go, since her pace is a bit fast for Sue’s horse. A look at my GPS track is quite enlightening. The first loop has radical up/down peaks from speeding up and slowing down. The second loop is steady and even through the first half (when we were alone and trotting) and then back to up/down peaks after we caught up again. Then the last loop is back to smooth steady trotting with Sue and her horse Trevor. We did not make the target speed of 8mph. And in fact just missed the 7mph speed. Although my GPS shows a speed of 7.2mph. I was very pleased with her anyway. She had a good pulse at her final check, and easily reached parameter at the checks. Although we slowed down and let those three horses go ahead, Dressy still got 2nd place. So it paid off to manage her pace a little bit. Chrystal’s horse, Grace won the Bronze level ride. By far. In fact Grace won the high score of the day… by miles. Her final pulse was 36. Chrystal took an extra long hold. Slowed her down as much as she could, and still finished in 6.99mph. The absolute maximum speed allowed for Bronze. If you watch that horse move, it doesn’t look like she’s working at all, and you can’t imagine that it’s fast. But try and follow on another horse and look at your gps…. Like a little streak of lightning, that mare. Diego had a good ride. Placed third in the Set Speed, behind Wendy’s young horse Firefly. He looked good all day when I saw him. Although Misha always looked unhappy to see us… Diego had a meltdown every time he laid eyes on his boss mare. Tore up his (non-electrified) paddock at the mid-check when we went out just as he had come in. Had a hissy fit on the trail when we passed him going the other way on two way trail. Not pleasant for Misha that’s for sure. However, after we loaded him in the trailer, Misha thought that he looked a little off colour. Wouldn’t take a treat from her hand. I loaded Dressy, gave her a cookie, and handed one to Diego. He didn’t take one from me either. We headed out, figuring that it was better just to get him home. The vet at that ride was Kathy, and she was going to stop by my place on her way home to look at King’s face (he still has a hard lump in his cheek where he was kicked). So we would have a vet available a few minutes after arriving at home anyway. I stopped at Tim Horton’s to get an iced tea (I was desperately thirsty) and Misha checked on him again. By then he was shaking and sweating. She was quite alarmed, and we got right back on the road. She called Kathy, who was just a few minutes behind us. If you’re going to have a horse colic on a trailer, it sure feels better to have a vet right behind you. We got him home and unloaded him. Stripped off the soaked cooler, and put him in a dry cooler and blanket. There was no manure in the trailer, so obviously he was a bit constipated. Misha walked him for a few minutes until Kathy got there. He had gut sounds but they were definitely reduced and gassy sounding. Kathy arrived, gave him some banamine, and got some mineral oil into him. It took about 45 minutes before he finally passed some manure. It was just a small amount and quite dry. But after that he got steadily better. This morning he’s his usual obnoxious self. 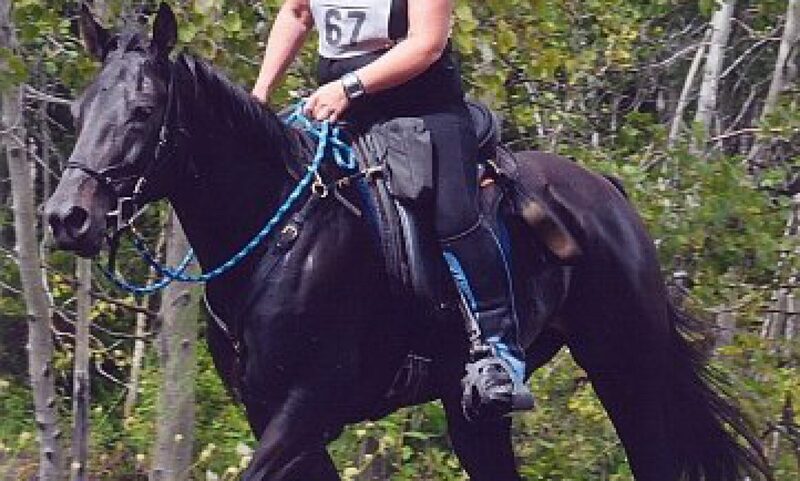 Kathy said that there were a couple of other horses at the ride that were of concern too. She figured it was the colder weather bothering them. Diego is definitely a hot weather horse, so that makes sense. Dressy of course, flourishes in the cold. She was bright-eyed and sassy while she tried to divert everyone’s attention away from Diego and onto her dietary needs. She wanted food, and she wanted as much of it as she could stuff into her greedy face. Dressy is entered in another Set Speed ride this weekend. She did really well last time in the rainy cold weather at Oktoberfest, and it looks like a similar kind of day is forecast. This time we are going to attempt a Silver (intermediate) level ride. This will be the first time anything above a bronze level ride has been held here. There is also a Gold (advanced) level ride being held, but although I qualify, Dressy is short a few miles. She’s not ready for that speed anyway (10mph). The Silver ride is 8mph maximum, which is about what she did at the last ride if you figure in the half hour we spent being late with Chrystal. I am not sure if we can quite get to the full 8mph, but we will see how it goes. She is definitely fast and steady on trail. But this ride will be 30+ miles (I keep hearing different numbers so I’m not entirely sure), so a little further than the last ride. And it’s always been a bit tougher for Dressy to get over that 30-35 mile distance. Lately though, I’ve been a lot more aggressive about electrolytes, and she seems to be responding really well. She’s getting RideRite instead of Perform n Win. I used PnW for years, and it’s been great for King. But for Dressy, it just never quite worked. The RideRite is about 3 times as strong, and the formulation is different. This year I’ve been a bit freer with the electrolyte doses. I’ve also started giving her BCAAs, extra magnesium and calcium, double her normal daily dose of vitamin e and selenium, and EnduraGin from Omega Alpha. It is way too complicated to give all that stuff during a ride one by one. So I generally mix it all up (except the RideRite which she hates… I have to syringe that in directly) in zip lock freezer bags with her meals. One for each vet check. She’s always starving, so I don’t have to worry about her leaving anything behind. In fact, I have to watch her at vet checks, because she goes shopping after she finishes her own meal and steals anything she can find lying around. Chrystal is bringing Grace to this ride too. I am not going to stand around waiting for her to tack up in the morning though. Dressy and I will go out at the regular start time. Chrystal is going to do her usual thing, and then catch up to me on trail. Grace is very very fast, so that will not be a problem I’m sure. Because Grace is only qualified for bronze level, she has to average a maximum of 7 mph. Dressy and I will be aiming for 8 mph. So Chrystal will probably have to stay longer in her hold to use up some time. If the trail is 31 miles, then we will have to finish in something over 3 hours and 53 minutes. Grace will need to do it in 4 hours and 26 minutes or more. Misha is bringing Diego too. He’s looking quite sassy lately. He’s been bucking, much to Misha’s displeasure. She’ll be in the bronze level ride as well. Diego had a mild virus last month, so she’s being careful with him. Oh! Almost forgot… Dressy is currently in second place for the season in the Set Speed horse rankings. She’s also in first place for the High Point Standardbred award. Of our three foals this year, the least well… likeable… has been Al. He’s a big handsome chestnut. But he was pretty much born snapping his little teeth (gums actually I guess) at any exposed skin within range. He has been trying to overpower us all since the first day. He rears, strikes, and bolts with glee at the least opportunity. He was sort of gawky and awkward initially. But we figured he would come out looking reasonably okay eventually given his colour and size. It’s so hard to know when they are little just how they will turn out. Lately though, Al has been blossoming into quite a stunning looking colt. Al’s mama is Bernice. She’s possibly the most beautiful mover I have ever seen in my entire life. Bernice can do things that absolutely defy the laws of physics. It’s visually stunning to watch her playing out in the field (which she does quite a bit… even in foal). But it’s sort of frightening to think about actually riding her. When he was first born I really didn’t see a lot of Bernice in Al. But it’s starting to show now. He’s developing a long, stretchy, floaty way of going that is sometimes a little startling in a weanling. Every morning I think “wow! look at that gorgeous little demon”… just before he tries to run me over. Lately Al does seem to have figured out that the humans really don’t like to be bitten. So he’s a lot more bearable than he used to be anyway. And he is definitely friendly. Loves to be scratched and is usually the first baby to come and see the people. It’d be nice if he learned to lead though. Rather than rearing up, and bolting off with humans in tow. Al has grown bigger than either Esmerelda and Reno (who is not an insignificant size himself). Although Reno is absolutely the king of the kids. He’s vastly more confident that either Al or Esmerelda. Strangely… Reno seems to have absorbed some of Twister’s personality. Kind of an obnoxiously obtuse twerp. The other two kids have become quite dependent on Reno to take care of them. They even try to nurse from him on occasion. Much to Reno’s disgust. I have a bit of a space problem here. Too many horses and not quite enough spaces. So I’ve been busy coming up with some solutions. Misha, who boards her two horses (Zamaluck and Diego) here, enlisted her family to come and help with the various projects this weekend. And Jen, who owns Twister, helped too. The first task was of course, just to repair the various fence damage that the horses have inflicted this season. Just keeping ahead of the broken boards is a considerable task with horses. They kick them, they chew on them, they run into them accidentally. Sometimes they run into them on purpose. Just a herd of wrecking balls with legs… that’s horses. There were a few top boards down between the various paddocks, and Twister, who apparently has discovered a hitherto unknown talent deep within himself, jumped INTO the paddock with Ares and Nikita the other day. Ares had no real problem with that, and so in the end we just went along with Twister’s preference and moved him in there. Nikita is completely blissed out now of course. She adores Twister. Truly, completely, and ecstatically. I looked out yesterday and saw Twister grazing with Nikita standing beside him resting her chin on his withers. Should’ve been on a postcard it was so cute. I scavenged some small walking gates to make things a little more accessible in the winter. They are chain link gates that were cast offs. 10 and 12 foot farm gates are great if you need to get tractors through. But they really are unnecessary and unwieldy in the winter when there are big snow drifts to contend with. So we put two of those in. One in the little side paddock (aka the “fat pony paddock”) with the small lean-to shelter. And the other beside the back door of the barn to make it easier to get to the manure pile. The run in area of my barn is really just one stall at the back of the barn with the front stall wall removed, plus the aisle in front of that stall. A second stall can be opened up to give them access to that. When I built it originally, I only had a couple of horses here. So it’s no longer really big enough for everyone. However, I came up with a plan to build a windbreak at the back of the barn to enlarge the comfort zone. The back door faces south. The prevailing winds come in from the west, over a large field. And as it’s all on the very top of a moraine (high ridge), those winds really do prevail. So we ripped out the old (rather rickety) fence section, and built a solid wall, instead of a fence along that west exposure. Hopefully, that will make the area just outside the barn quite sheltered for whoever cannot find space inside (that would be everyone but Dressy). We also added the small walking gate, and replaced the old (wrecked) farm gate with a new and slightly smaller farm gate. As you can see, the wall is made from reclaimed lumber from my junk lumber pile. So it’s a little scruffy. But I think it will be quite good shelter from the wind. And there is the new walking gate right next to it. We rebuilt the big sliding door at the back, which the horses knocked down one day and walked all over… punching hoof-shaped holes through the plywood. It’s patched with leftover plywood bits and pieces, but at least it is solid and strong again if not too pretty. I bought a cheap farm gate to replace the front wall of the stall that was opened up for the run in area. I will keep that folded back against the wall normally. But this way, if there is bad weather, I can close the gate to create a temporary stall. That will give me four stalls (Twister and Nikita can go in one stall together), plus the half of the run in that is left, which becomes a quasi-stall when I close the sliding door at the back. Plus the little run in shelter in the side paddock. So seven spots. For seven horses. They’ll be packed in like sardines of course. But it will do in a pinch. The little side paddock where I keep the fat ponies in the winter had a big farm gate too. But it was very difficult to get such a long gate open in winter. The snowdrifts tend to build up there and it’s a lot to dig out. So we put an extra post in and put in the smaller walking gate. I truly TRULY hate to write this next bit… however, we discussed the issue of not having a bigger gate to get the tractor into that paddock. But since I plan to put another slightly bigger gate on the other side of that paddock, I decided that it was no problem. At that point we were all very tired. Really tired. Okay… stupid with exhaustion. Because we were all standing there looking at the tractor. The tractor that I’d just finished digging a post hole with. INSIDE the damn paddock. Not one of us clued in and drove the tractor OUTSIDE the paddock before finishing the fence. We had to take down the temporary boards over the gate-to-be on the other side to get it out afterwards. The horses were all quite beside themselves with curiosity while all this activity was going on. They were locked out in the main pasture, but spent most of the weekend staring longingly over the gate at all the people milling about. And at all the new STUFF to check out. Once it was all done, they scampered in and inspected it all with great care and interest. Nosy devils were probably planning future destruction….